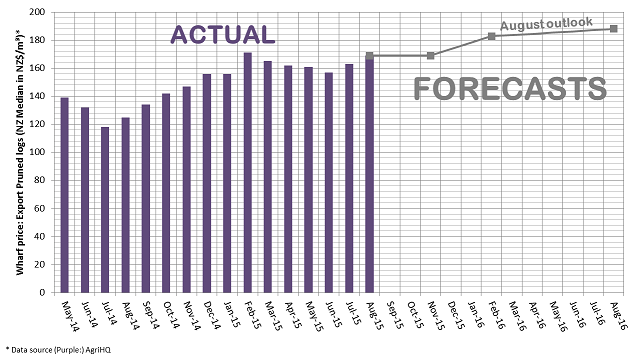 This article provides a brief overview of web-based log price outlooks that were carried out during August 2015. The majority of 54 participants agreed that pruned and unpruned log prices will remain flat for the rest of 2015 and may see relatively small price increases in 2016. Figures 1 and 2 show the current and historic price outlooks for unpruned and pruned logs, respectively. 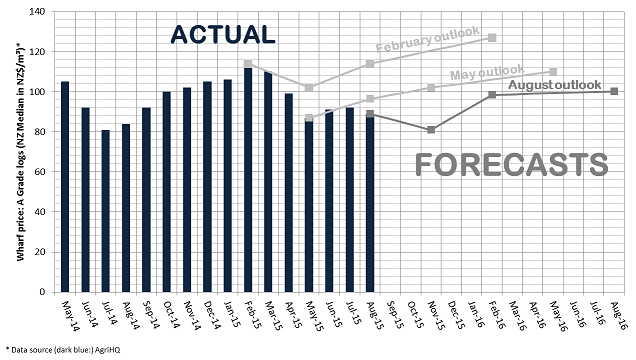 SCION repeats its log price outlook in February, May, August and November. The information is packaged and sent to all people who participate in the outlook. Please email carel.bezuidenhout@scionresearch.com to be included in future communication pertaining to these outlooks. The next log price outlook will take place from 16 to 30 November 2015. It should be noted that these log price outlooks are based on an independent survey and don't represent the view of any one individual or organisation. As such, and also due to issues of timing (the latest outlook was conducted in August), these outlooks may differ from views expressed elsewhere in Wood Matters. China market is soft and uncertain, and will remain so for at least 12 to 18 months with a slow upswing as the oversupply of stock is reduced. The Chinese economy is currently transitioning from an export focus to a domestic consumption focus. Housing in China is in over supply and construction is down. Log marketers and consultants are over-optimistic perhaps even disingenuous. Overall the log export machine is efficient and uncoordinated; hence NZ has the capability to uncontrollably flood the market. NZ volumes are growing and ports are expanding. The lower dollar will help, but limited room for the NZ dollar and freight costs to fall any further. Limited ability to change markets (to India or elsewhere). USA housing is starting up, US$ is high and log exports from USA has dropped. India demand is rising and there is a shortfall in hardwoods from Malaysia and Indonesia. Zhangzhou, Lanshan and Manzhouli (land) ports are the most important ports for imported soft logs from New Zealand and Russia. These ports and are under pressure from the government for air pollution. Chinese buyers have liquidity issues, but the situation may be tempered by lower shipping rates and maybe NZ$/US$ exchange rates. Supply will decrease over the next 3 months so we will see an increase in US$ pricing. NZ$ will continue to drop and combined with higher CFR prices will improve AWG returns. I think the price is at an upper limit and more pruned is coming on stream. Demand for products made from pruned logs appears to be holding and modest growth in consumption in most Asian countries. Limited supply and increasing prices encourage delayed harvesting. Pruned pricing into China has been steady through ups and downs, demand is good and markets are mature. Pruned logs feed both the furniture and plywood segments. Plywood will be held back by housing inventories in China, but furniture and internal fit-out is a growth area. Domestic pruned log prices will rise over the next six to twelve months. Export prices will have to keep up.